A packed audience listens to Ron Motsinger, assistant business manager for Local 252 electrical union, address the Ypsilanti Public Schools' Board of Education at last night's meeting. 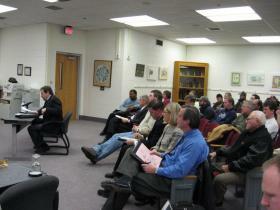 Jan. 13, 2009 · 9:06 a.m.
Ypsilanti Public Schools’ Board of Education chose to go with union labor for the next phase of its 2007 bond projects. The decision was reached unanimously after a dozen people addressed the board during its meeting last night. The various changes increased the estimated $3.76 million dollar cost by 5 percent. “It’s great,” said Ypsilanti resident and union electrician Jay Tafini, after the board’s decision. An Ypsilanti High School graduate who told the board how much he enjoyed doing the work to the high school last summer, said, “I hope I get a chance to work again at Ypsi Schools." Only work for Adams, Chapelle and Erickson elementary schools was discussed at the meeting. The new cost is estimated by the board to be $3.95 million. Paul Wills, vice president of Plante Moran, said the rest of the second phase, for the district’s middle schools and the work on the high school that wasn’t completed last summer, will be discussed at the board’s Feb. 9 meeting. After the board elected to change the contracts awarded to union companies, Wills said there could be some contingency costs. He said he will present a more firm estimated cost to the board at the same meeting. Phase three of the bond project will be various administration buildings used by the district. It is expected work will start on those buildings next year. The work is an overhaul of infrastructure and technology in the buildings and is broad in nature. Anywhere from 13 to 14 contracts were awarded to companies for each school. Though the companies selected by Plante Moran were the lowest bidder, the board elected to change three or four contracts per school in order to use union labor for the work. Most of the people in the audience were speaking out against the choosing of Great Lakes Power and Lighting for the electrical work. Union employer Metro-Electric was selected by the board for the district’s electrical work. Trustee Kira Berman proposed the changes, and numbers, to the board. She had created several different options for the board to consider. Andy Fanta, another trustee for the board, publicly thanked her and said the union labor would allow him to trust the work and the extra money would be purchasing a more quality product. “Hopefully we’re getting a product that is made by workers with decent health benefits as well,” Berman said at the meeting. Ron Motsinger, assistant business manager for Local 252 electrical workers’ union, said many of the 210 electricians he represents have been laid off for some time. He said 30 percent have been unemployed since October, forcing many to travel around the country in search of work. The only non-union company selected by the board was Steel Equipment Company, which will be installing new lockers in Erickson and Chappell. The board elected to go with this company because it had installed the lockers used last summer at the high school. The largest increase in cost was at Erickson, where the $1.37 million bottom line was increased 8 percent to $1.48 million. The increases in other buildings hovered at 3 percent. Berman and other board members pointed out that using union labor will give local residents the chance to do the work for the district. It was brought up that some of the union contractors live, pay taxes and vote in the district. Using the unions would give these workers the chance to handle the jobs here in Ypsilanti. Though he voted in favor of the changes, Trustee Floyd Brumfield did raise caution. “I also believe in saving,” he said.